Life. There's a lot of it. I sometimes eat summery dinners in winter, I’m the Wild Child of Food. The monochromatic landscape of Britain in winter makes you forget the existence of other colours. We may as well live underground. In these circumstances, a red pepper can be cheering to your blinking, moley eyes. 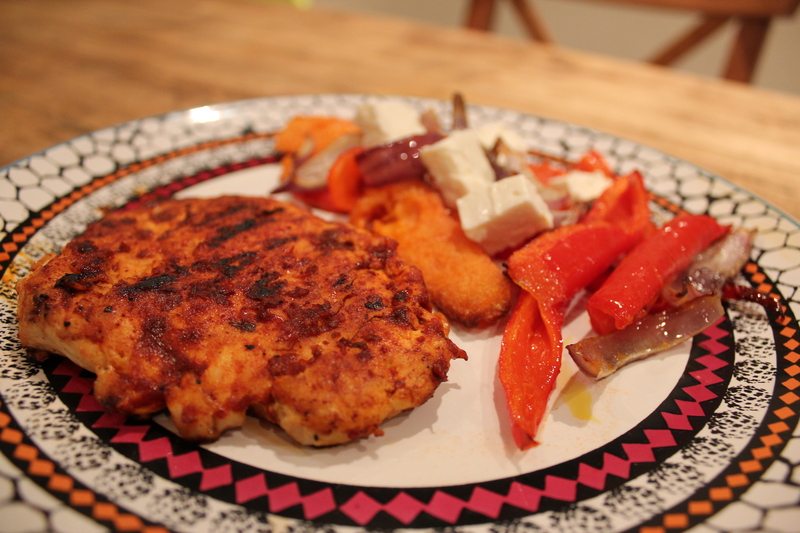 This is a simple dinner, the chicken is from the Hairy Bikers (Hairy Dieters, first book). I roasted butternut squash, red peppers and red onion but you could use any vegetables. You will need a griddle pan. 4 tsps of harissa paste (I used Tesco Ingredients range). Half a butternut squash, peeled, deseeded and sliced. 2 peppers, sliced. I used the long pointed ones but any will do. 1 large red onion, sliced into wedges. Feta cheese, or any cheese, to serve. 1. Heat the oven to 190C Fan/Gas 5. Put the squash in a roasting tin with a couple of tablespoons of olive oil and some salt. Roast for 20 minutes. 2. Place the chicken breasts under a sheet of cling film and bash with a rolling pin until thin. You can imagine it’s a person you hate, if you want. 3. After 20 minutes, add the pepper and onions to the squash. Roast for another 20 minutes. 4. In the meantime, oil the griddle pan and then heat until very hot. Sear the chicken on both sides. When the chicken is almost done smear 2 tsps of harissa on one side then turn it over to the heat. When nicely charred, smear 2 tsps on the other side and turn over again. Sizzle for a few minutes more until cooked through. 5. Serve with the vegetables, some feta or other cheese. Sunshine on a plate! Love it!